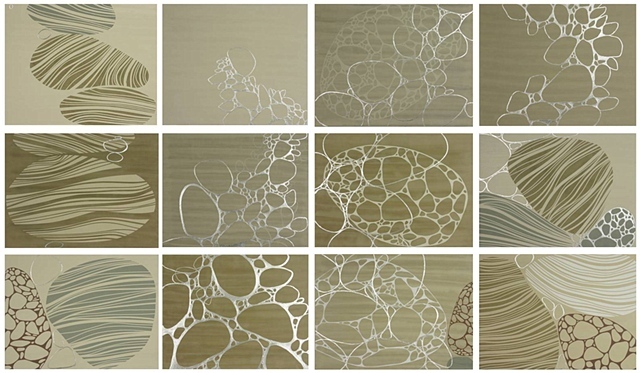 The paintings in this continuing series are formed with tinted Venetian plaster and silver leaf, utilizing the repetition of patterns, some inspired by nature and others found in Japanese and Modernist design as well as in scientific illustrations such as "Forms in Nature" of the 19th century German zoologist and illustrator Ernst Haeckel. The replication of pure form that develops reflect upon movement, chaos and the path that is taken as increasing levels of complexity begin to emerge. These graceful forms tend to evoke a meditative response and lie somewhere between a state of object and pure abstraction. "Transparency", the recent one person exhibition at the Cheryl Hazan Gallery extends the exploration of a single repetitive form, a continuously crafted line resulting in a concentric shape. These organic stratums build upon each other and morph into the unexpected. Precision is avoided, however a loose set of rules, geometry and strategies are a crucial aspect as evidenced in the way each piece is approached. Past work included in the one person show, "Sustainable Light" at the Cheryl Hazan Gallery refer to specific moments when time becomes suspended and the state between abstraction and reality become blurred such as a long musical note or a backlit leaf endured throughout the long light of summer; the perpetual movement of light filtering through the trees. There is also the physical factor; the economy of image and material. The essentials of statement, nothing more or less - modernist. Tinted plaster is applied in many layers and burnished to create a surface of depth to which silver leaf is applied and then either left to naturally tarnish or is blackened through a chemical process. The aging of the silver is the preferred method of achieving a record of the passage of time and the best chance for unexpected nuances to emerge as the piece goes through a long process of change. In the silvered areas of the paintings, the ability to witness the sustained light that occurs is most evident. However, the recent work depends less on the silver process and more on the interplay between light, form, line, balance and instability.